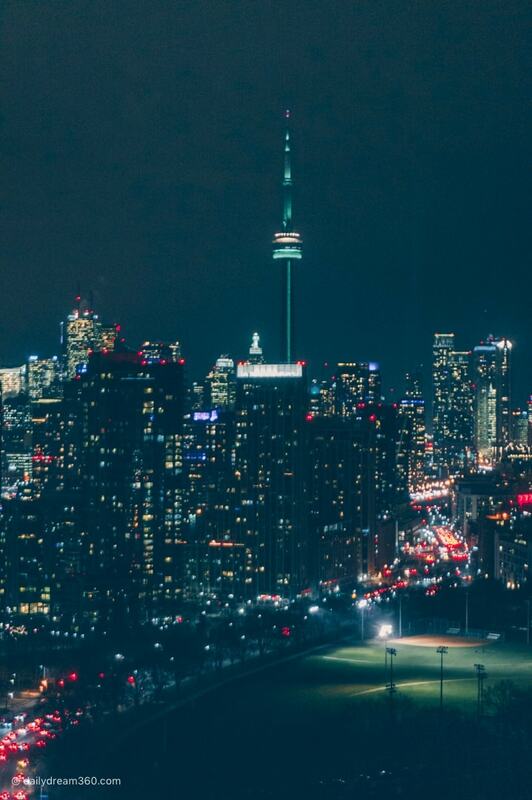 No doubt you’ve seen a photo of the breathtaking views of Toronto’s Skyline from one of the windows at the Hotel X. 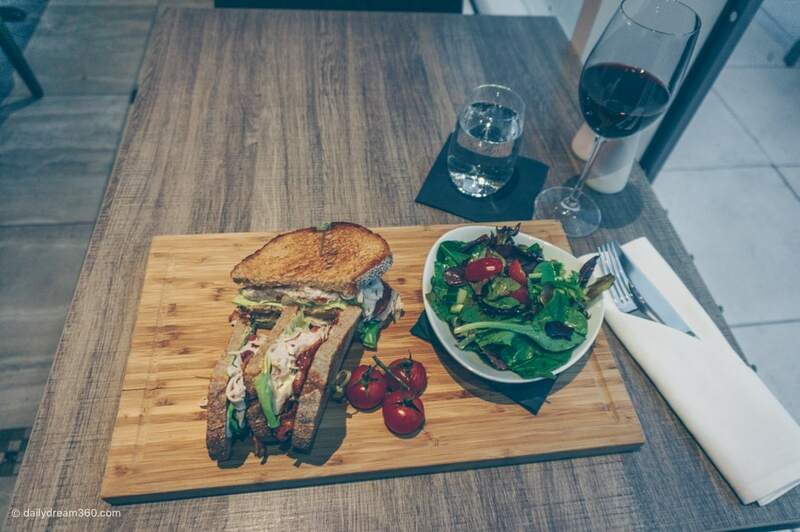 If you haven’t, I have a few in this Hotel X Toronto review. 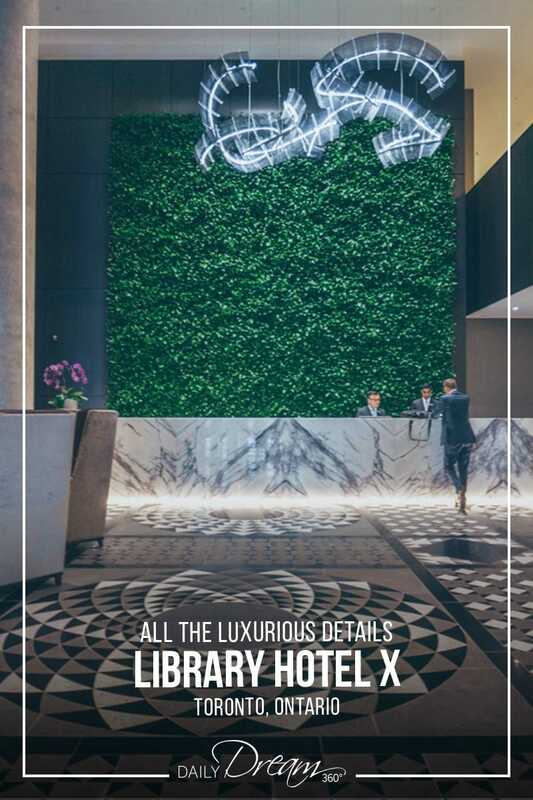 Located across from Exhibition Place just outside downtown Toronto, the Hotel X’s location may seem a bit out of the way at first until you start to look around. 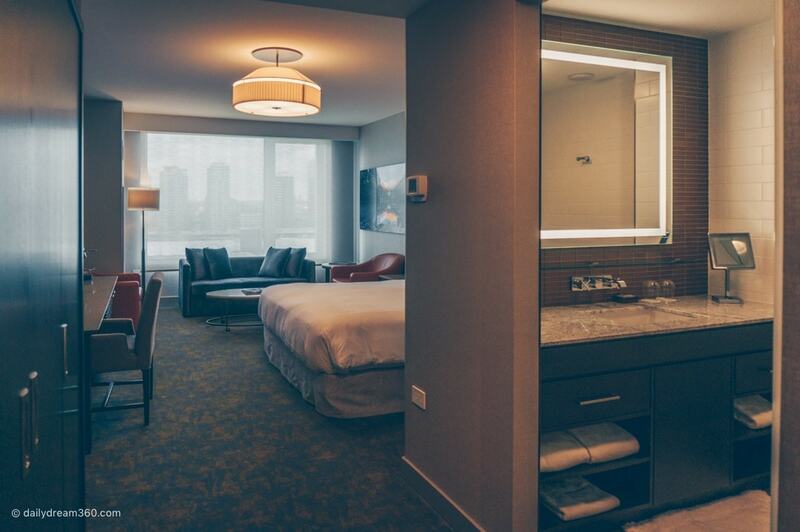 Just steps from Toronto’s Exhibition Place, this hotel is ideally located for those attending conferences and events in the area. 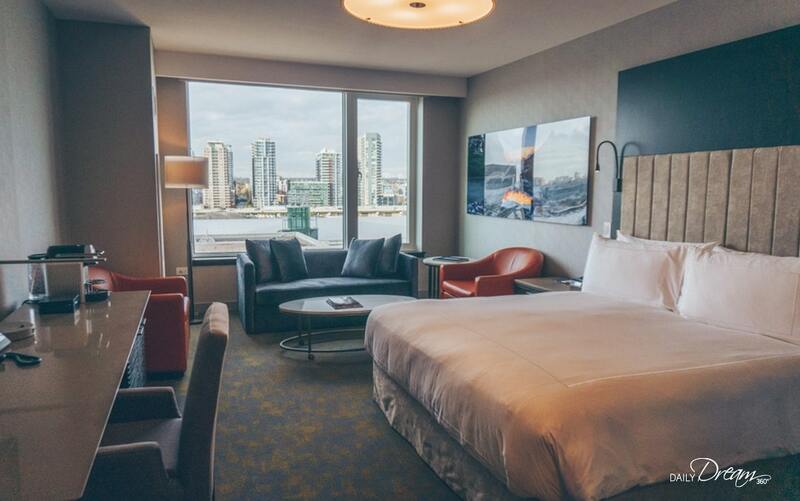 It is also steps from Billy Bishop Airport making it an excellent hotel for business travellers coming into the city centre’s airport. There are complimentary shuttles to bring you out to the Exhibition grounds from the city centre, and an Uber ride won’t set you back too much. 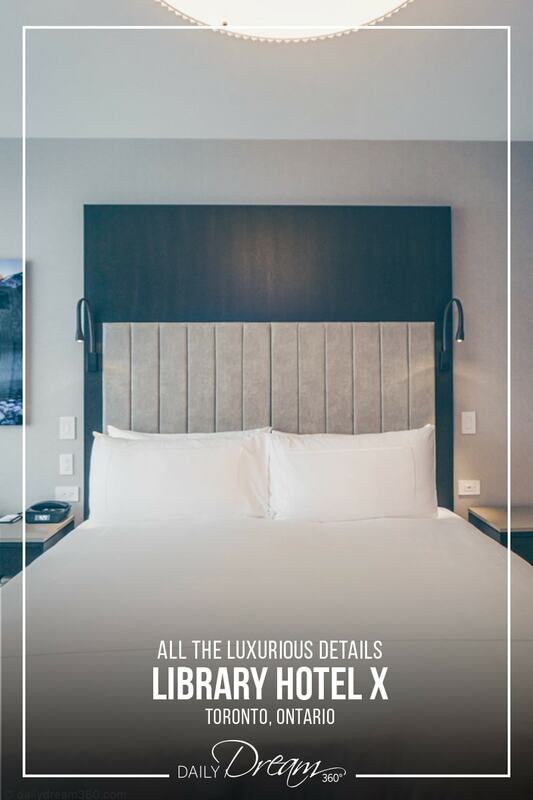 Perhaps it is this out of the way escape that makes it so popular with celebrities, but now that I stayed here, I know it is the luxury amenities and commitment to service that set it apart from other Toronto luxury hotels. The room I paid for at a conference in Toronto was a bit disappointing. No luxury view, no turndown service and it made me sad that I was spending a luxury hotel price but not getting a basic thing like turndown service. I don’t want to be a diva but if you are staying at a 5-star luxury hotel isn’t turndown service an apparent touch? I’m not going to say the room or the hotel was a disappointment. It wasn’t; it was the perfect size for me, had a great bed, a sitting space and a Nespresso machine. The major luxuries I’ve grown to love about any hotel. 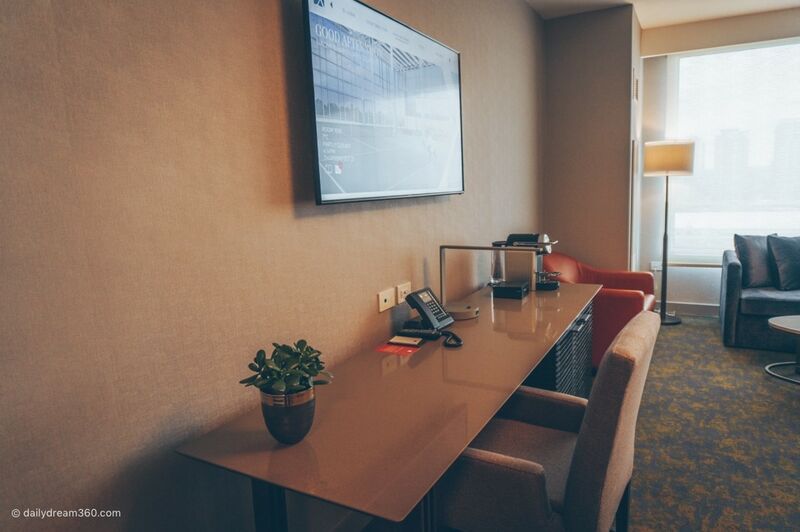 As a conference guest, the space to lounge and sit and catch up on notes/work, the long desk, and the huge bed, it was the perfect escape each night and during little breaks I had during the day. The view was north of the hotel and didn’t offer much excitement as their website described, but there are plenty of spots around the hotel to enjoy the views. The bed was extremely comfortable and had a pillow top mattress and comfy pillows that made it hard to get out of in the morning. 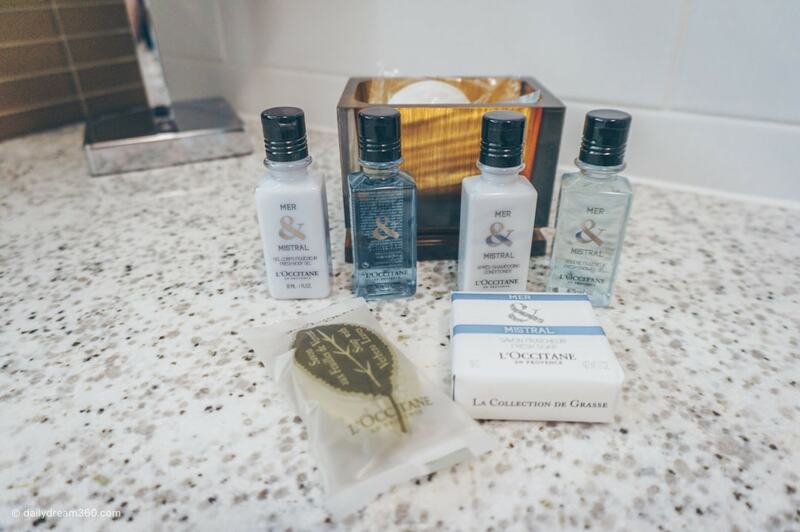 The bathroom featured a granite countertop and luxurious L’Occitane bath products. Funny story I had left a note for my housekeeper to provide me with a shower cap – there is a small drawer under the sink with three additional items hiding away. An emery board, shower cap and sanitary bag. Not sure why some of the toiletries, cotton pads, elastic etc. were on the counter, and these three things hidden. I didn’t even know there was a drawer there, but she pointed it out in a note back to me. The staff was terrific, and any request handled as you’d expect from a luxury hotel, but no turndown service? This baffled me as I know people who have stayed in the business suites did get this service. 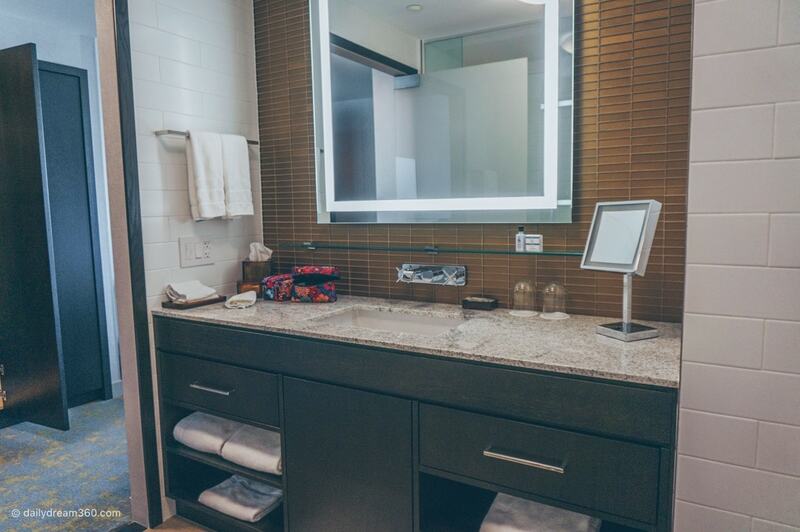 Why not set the standard from your basic rooms to your luxury loft suites? 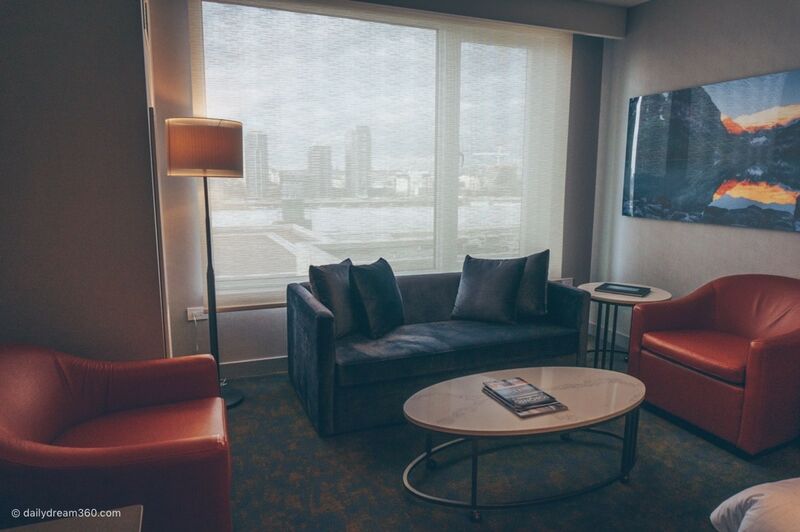 The following are a list of features for the signature king room. Alarm clock radio with charging cables for every type of device. For first time guests, I recommend you have a bellperson walk you to your room. Mine walked me around and thankfully explained how to use the control panels located around the room which activated the lights, dimmers and the two window shades (one is a blackout shade and the other provides privacy with light passing through). Signature Room is nice but is it worth it? 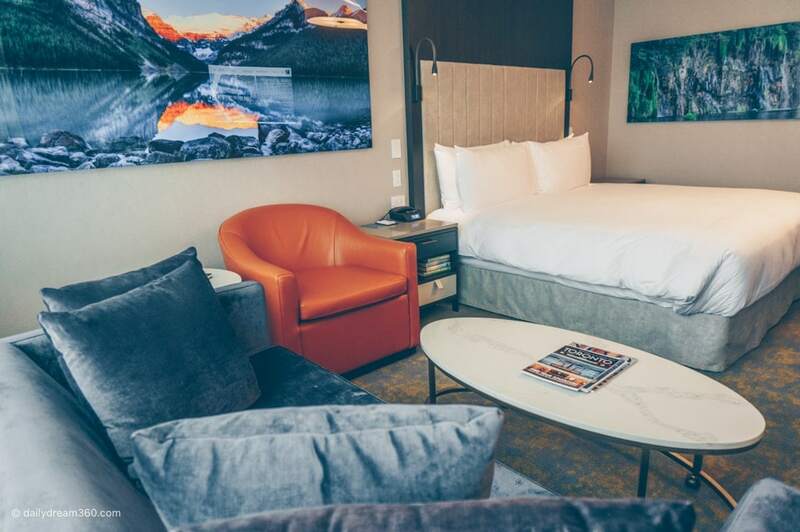 If I am paying for a hotel room in Toronto, I will choose a hotel located in the city centre vs this room if I had the choice again. It was nice to be at the same hotel the conference, but the room was far too basic for the price I paid. 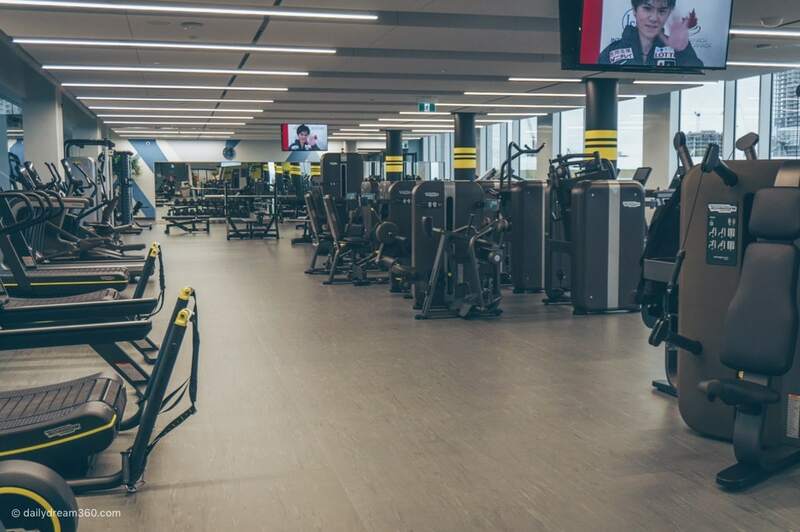 TEN X Toronto is not just a gym but a full-on Athletic training facility. 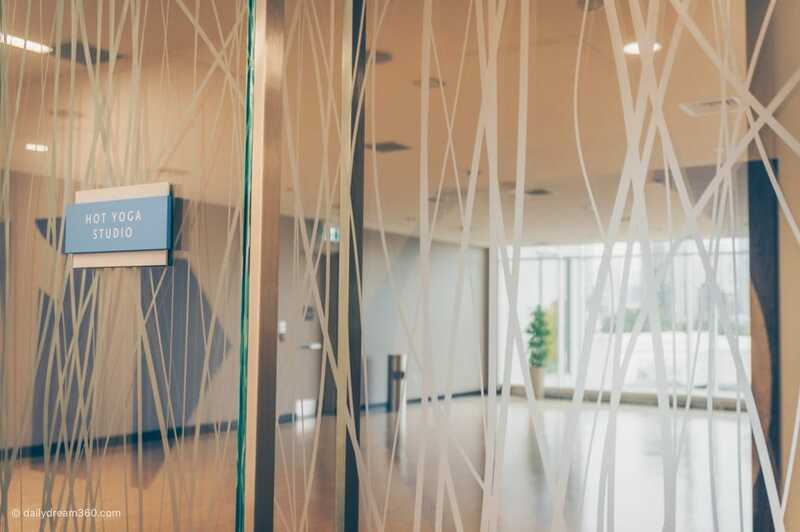 The best part is that guests at the Hotel X have access to many of these facilities free of charge, and other services are purchased for an additional fee. For those enthusiastic about their fitness regiments while travelling this is a great perk. I promise you; you’ll get the best workout possible during your stay at this hotel. The gym is packed with any equipment you might need and even a few machines I’ve never heard of. Don’t be surprised if you find yourself working out next to a famous athlete. 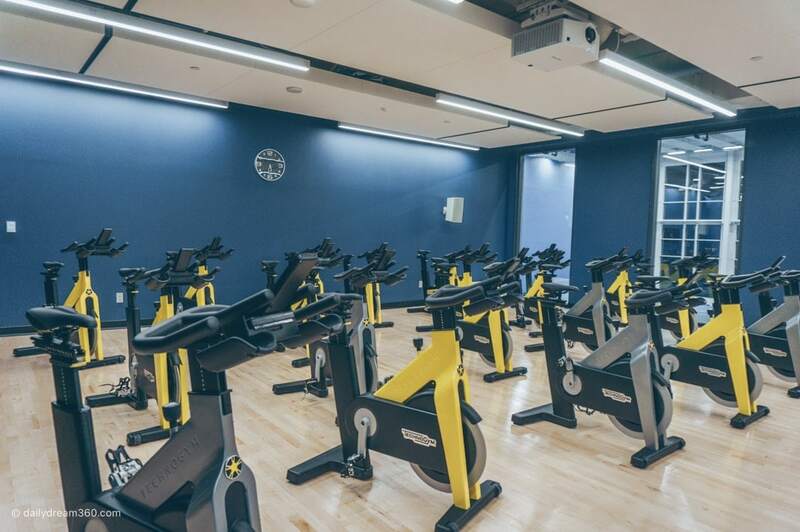 I found this gym a bit intimidating actually, but as soon as you speak to the staff, they are so helpful and will help you with any machine in the facility. They were also very informative about classes you can join for a small fee. I would have loved to do a morning yoga class, but it never fit in with my conference schedule. 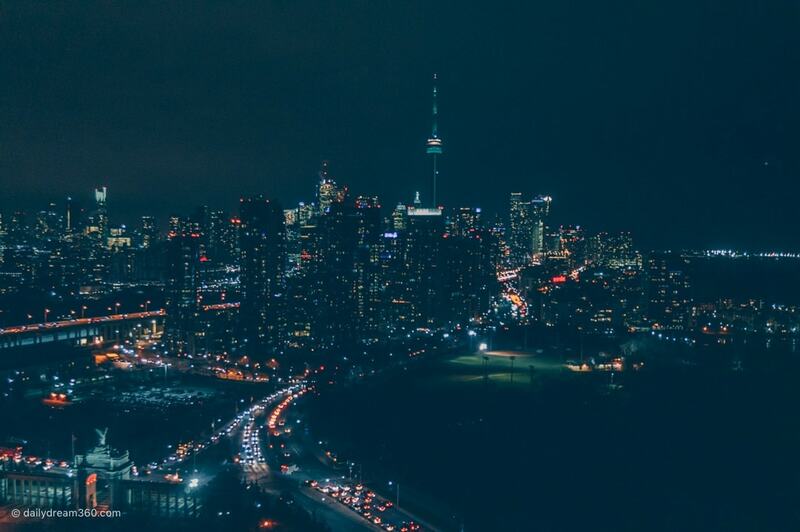 Here are some of the major facilities available in TEN X Toronto. 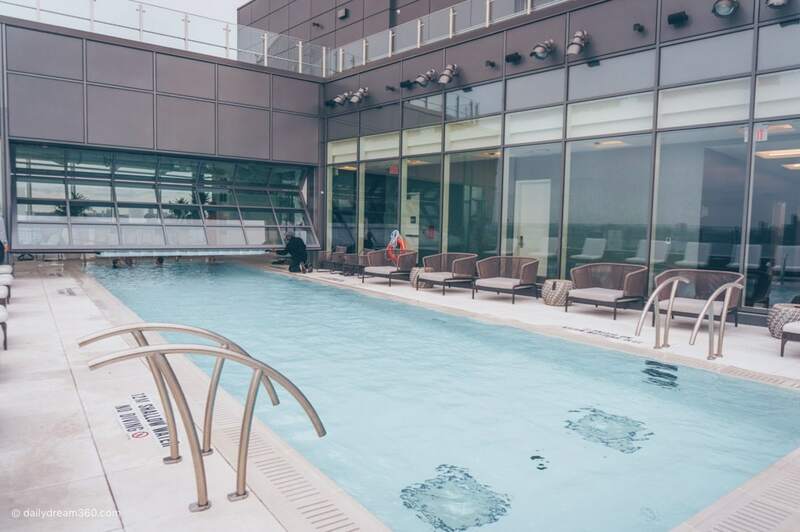 Fear, not the rooftop pool is heated, and yes it is open during the winter. 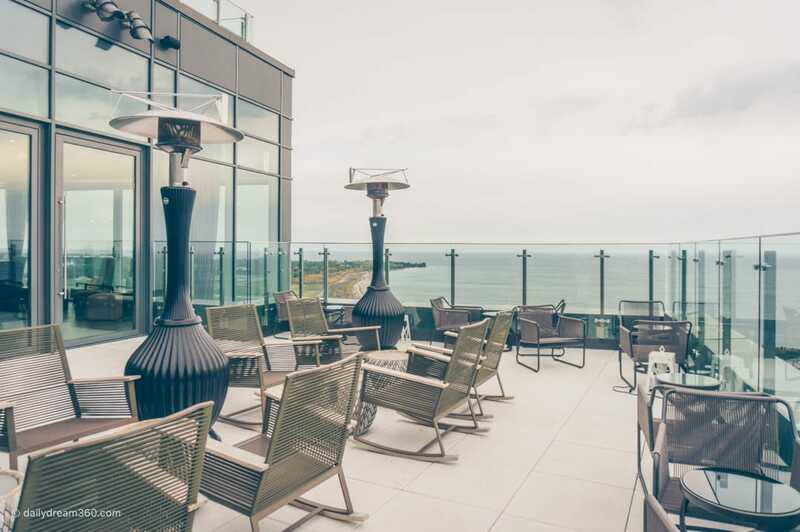 While you may not want to lounge on the pool patio in winter, in summer, it offers breathtaking views of Lake Ontario. There are some spaces in the hotel where you can get a bite to eat. A new restaurant is planned in the future, an expansion of Pétros 82 Lobby Bar. As I attended a conference most of the food I ate was through catered breakfasts and lunches in the conference spaces. That said I did manage to sit for dinner at Maxx’s Kitchen. I would have liked to see a few more healthy options on Maxx’s menu. I chose a turkey sandwich and swapped the side with a salad. However, I did struggle with this menu a bit and would have like to see a better balance of healthy things to eat across the appetizers, salads and main dishes. 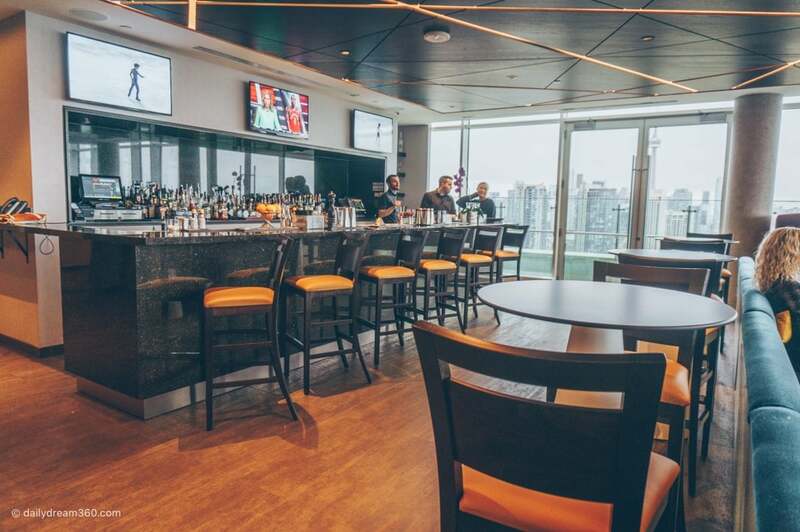 The views from the Falcon Sky Bar are pretty spectacular. In fact, as a hotel, guest this was one of my favourite spaces at the hotel. Staff at the Falcon Bar were very friendly, both when I visited as a guest of the hotel or was there for meetings. I have to say if you are looking for nibbles and another place to eat at the Hotel X, the Falcon Skybar should not be overlooked. 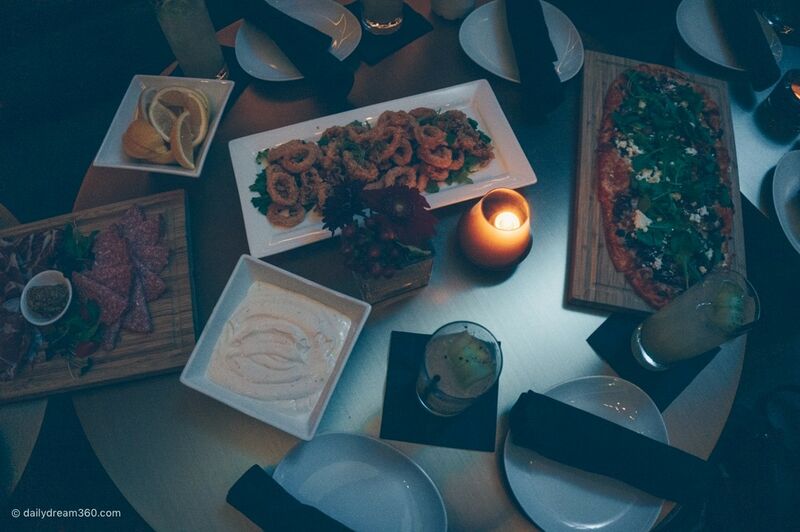 There are some great crafted cocktails, delicious food from charcuterie boards to flatbread pizza. 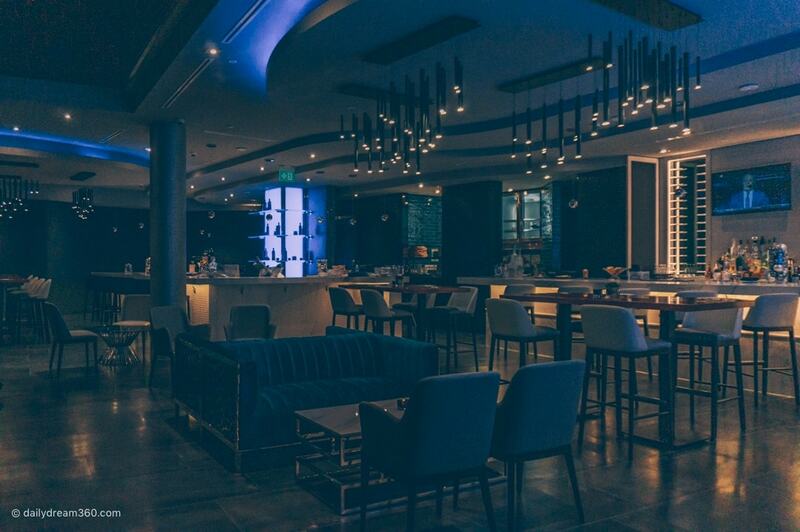 For now, Pétros is the hotel’s lobby bar, but an expansion is expected in the future. I did not spend any time here so I can’t report on the food or drinks served. 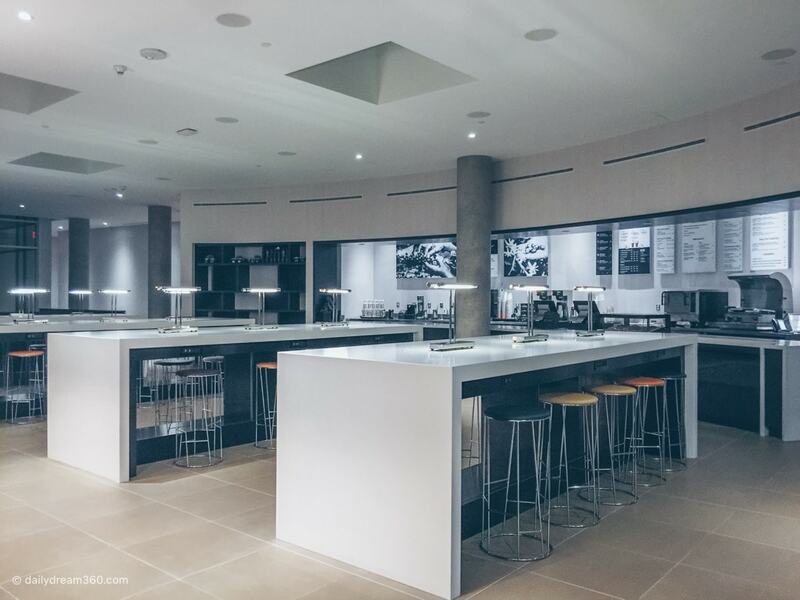 If I had more time, I know I would have spent some time here at the Nespresso cafe to do some work. Even though there was a Nespresso machine in my room, it is nice to have the option to grab a coffee and lounge in either of the hotel’s 2 cafes. Also located in the gym area of the hotel is a wonderful kids play centre filled with toys, and video games for kids of all ages. 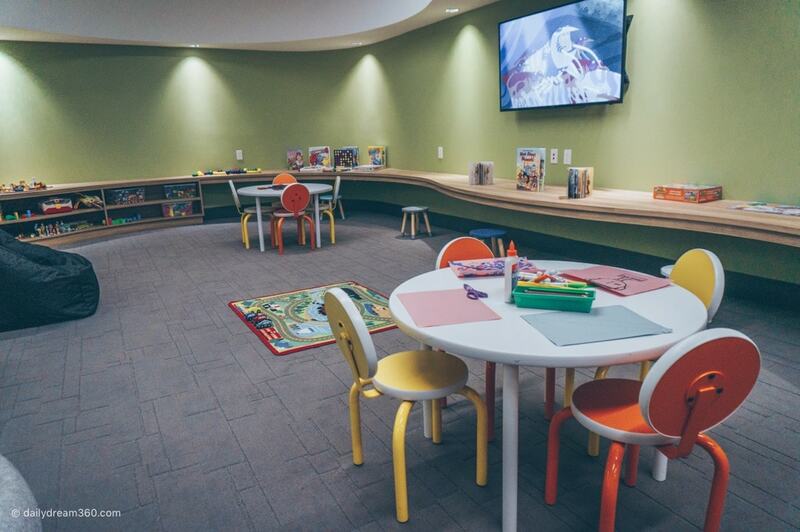 I am not talking about a little room with a few toys but a 3,000 square foot play space, with trained caregivers, an indoor sport court and arts and crafts area. Hotel X Toronto has a 250 Seat Cinema and a smaller Screening Room with 56 seats. Be sure to check the hotel’s calendar for movie showtimes which include family-friendly films for small children. If you need to kill some time, or are looking for a good book to read, be sure to head to the library located just outside the lobby. 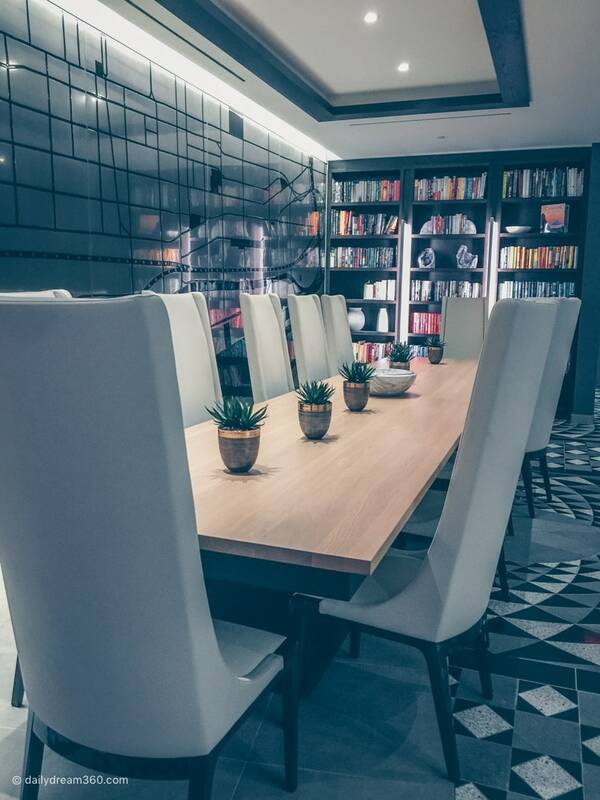 There you will find a huge bookshelf which you can help yourself to a book or just sit and work at the large library table. Down the hall from the library be sure to take a walk through the Kandy Gallery. 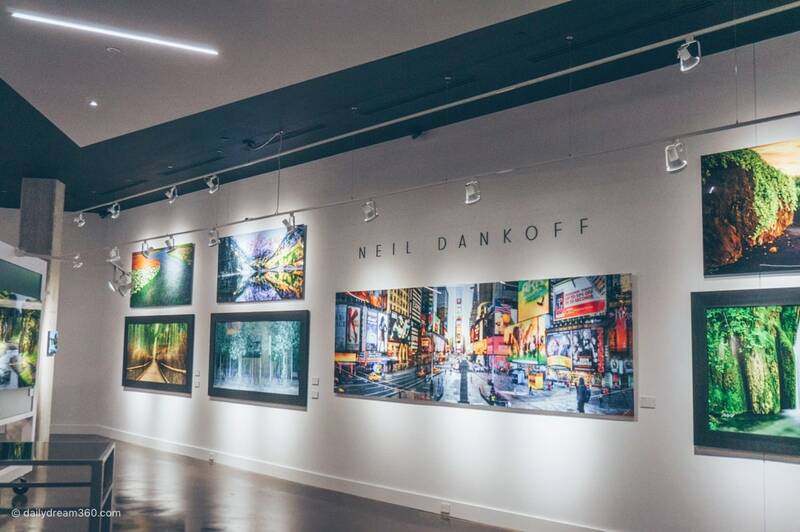 There you will see the many works of Neil Dankoff whose works you may recognize around the hotel too. At the moment there is no spa at the hotel. However space is allocated and construction is underway, so you can expect to see these services soon. 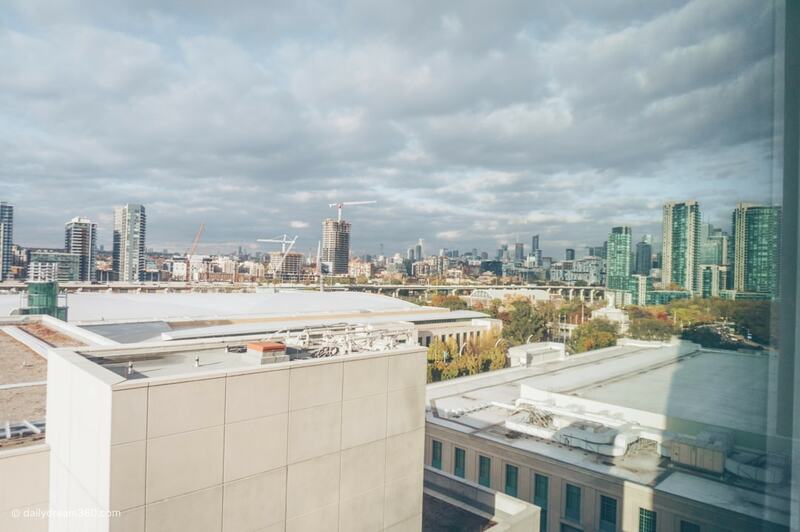 I paid a conference rate for my stay at the Hotel X Toronto.